How is it possible that we have shortage of coco pith although there are so many plantations ? Worldwide there are more than 10 million ha of coconut plantations, which (theoretically) provide us with enough raw material to produce 80 million m3 of coco pith yearly. Let us first look at the market: worldwide we see that grow bags with coco pith (in all sorts) are more often used because of the good physical characteristics, the interesting pricing compared to Rockwool, more consultants are able to give good advice on analyses etc. Companies are looking for alternative methods to guarantee enough products for the customer. An example is thermal drying, which is done in some places, but costs a lot of energy and sometimes seems to change the physical characteristics of the coco pith. Another possibility is to agree with more humid material and ship it slightly moist. Here we see that less material can be shipped, which makes the product more expensive and another factor is the shipping time; it costs more energy to transport fewer products. Another option is better storage. Actually the same counts for peat moss: store the product after drying and ship it all year round. It sounds rather easy but it will ask for a lot of discipline from the producer as well the willingness to pre-invest and pre-finance huge volumes of coco pith. So, for Coco products we have to deal with the weather: after producing the coco pith (buffering, washing etc. ), the Coco pith is dried on concrete floors. This drying process is essential for the production as only after drying, the Coco pith can be pressed in blocks. In recent years, we’ve encountered problems with heavy rains during times we were not used to have them. This resulted in a lower production in a growing market. Note of Dutch Plantin: As Dutch Plantin we really were happy to have many locations in India and Ivory Coast as well. Nevertheless actions had to be taken during the recent period. First of all the production and storage capacity in India is more than doubled. Many sheds are built to store coco pith, coco chips and coco fibres. 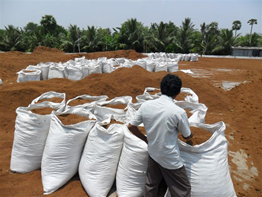 In one of the main coconut areas in India, DP has a storage capacity of over 4.000 m3 of coco pith. Although this is a big pre-investment, the reliability of deliverance is so important that this kind of investments for the future are crucial for a professional company. Besides the extra capacity in India, the locations in Ghana and Ivory Coast are also upgraded by new investments and improved capacity.